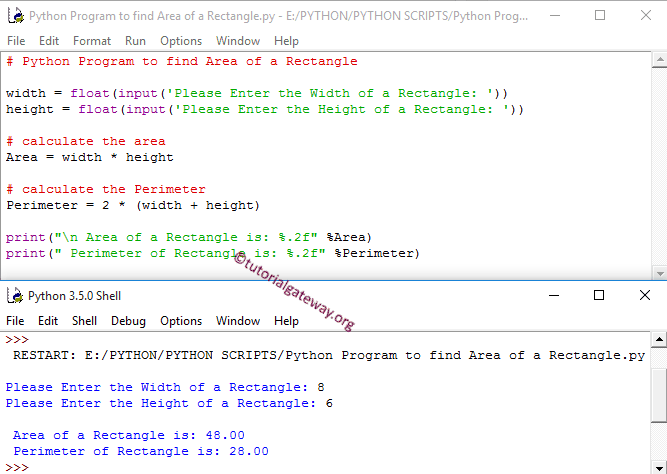 In this article we will show you, How to write Python Program to find Area of a Rectangle and Perimeter of a Rectangle with example. Before we step into the program, Let see the definitions and formulas behind Perimeter and Area Of a Rectangle. This python program for Area of a rectangle allows the user to enter width and height of the rectangle. Using those values we will calculate the Area of a rectangle and perimeter of a rectangle. This Python area of rectangle program allows the user to enter the width and height of a rectangle. We will pass those values to the function arguments to calculate the area of a rectangle. Within this Python area of rectangle program, First, We defined the function with two arguments using def keyword. It means, User will enter the width and height of a rectangle. Next, We are Calculating the perimeter and Area of a rectangle as we described in our first example.